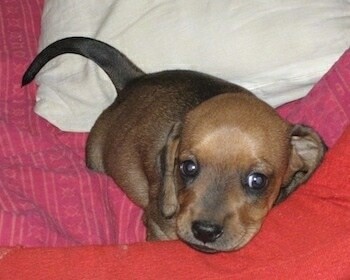 As a pet owner I recently had a terrible experience with my Dachshund, Caramel. She had a gorgeous litter of pups, three male and three female. We had taken ultrasounds, etc. earlier, and the mother and the pups were healthy. Caramel had already had a healthy litter four years ago when she was a year old so we weren’t worried. But…the pups started to die one by one a day or so after they were born. We sat up night and day trying to save them, and called every vet we knew in town. We were not successful. Five beautiful pups died, and just one remains alive today, and is still struggling with his life. I would like to thank Dr Mahendran and his team at CGS Hospital, Gurgaon, especially Dr. Shally Mattoo who today tells me that she feels just like an owner! (Sleepless nights, sheer terror, etc. associated with a sick pet!) They not only took in Subbu (Subramaniam, the last remaining pup, also the first born) despite not having neonatal facilities or experience, but actually created a special Neonatal ICU for him. They’ve tried everything they know to save his life. He spent ten days in the ICU. No one really expected him, of all the pups in the litter, to live. He had a severe umbilical cord infection, was lying lifeless and still for an entire day unable to suckle, could not even utter a whine and was fighting for his breath. It is really heart rending to see a pup who has a mother but can't suckle, and a mother who is miserable, in milk, and can’t nurse her pup. Unfair. Today, as I write this article, he is 17 days old, he is still very weak and has issues with digestion and immunity, has a tendency to aspirate fluid and we can’t feed him as much as we want to or as much as he needs though he seems to be starving and suckles everything in sight! He has opened his eyes a bit too, and seems amazed to see us when we lift him up to eye level. The mother and the pup are curled up together happily. He's suckling away, and the contentment in her eyes is wonderful to see after the anguish she has been through. We're still praying that nothing goes wrong and that Subbu doesn't get sick again. We are still not sure that he will survive. He is so little and helpless, and trying very hard to live despite the fact that almost everything is against him. 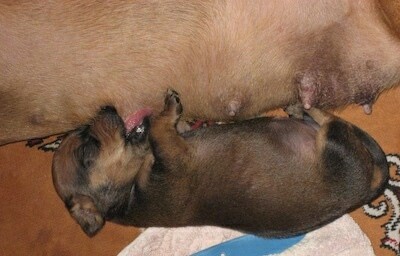 The pups were born early Sunday morning, 3 a.m. Caramel, the mother, had a distressed labour. We’re not dog breeders, just owners who love our dog very much. We never expected when we hunted for a mate for her that granting the one wish that Caramel seemed to want most in her life—being a mother again—would turn into this terrible nightmare experience both for her as well as for us. One pup, the runt of the litter, was born an hour late and was weak; the others seemed OK. We consulted the hospital and nursed the pup a little, supplementing his feed with honey and very dilute lactogen (for human babies), since we didn’t have puppy milk the first day. A night after she delivered, my dog was still whining and crying in distress. The vet whom we called asked me take her for a walk. But I think there were more serious underlying issues: She was either in pain, didn’t have enough milk or had an infection herself and was desperately trying to tell us something was wrong. We just didn’t understand. The vets didn’t help us much either at that time. By Tuesday morning a pup was dead, and he wasn’t the runt of the litter. He had seemed quite healthy. We got a real shock. 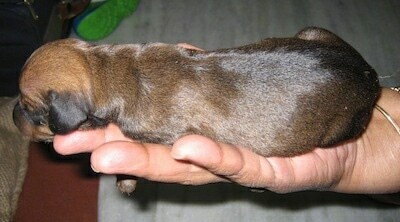 The runt died too by that evening and we really started to panic and call all the vets we knew in Delhi. We now understood that every time a pup was about to die, or something was wrong, Caramel would get really distressed and literally try and point him out to us. Some of them suggested that it might be fading puppy syndrome. I had never heard of it before. That night we kept them under the lamp, fed all of them a little extra every two hours, and gave them a drop of Betnesol to encourage suckling. We also started supplementing Caramel’s diet with calcium and glucose to increase her milk flow. That was about the time I started to read all the articles extensively on the net, and got in touch with a few people. By midnight the four remaining pups weren’t doing that well and we rushed them to the emergency at the hospital as they were all quite lifeless. We were told to continue with the feeding/honey every two hours as the pups were dehydrated. I remember losing my temper with the vet on duty Tuesday night and asking him to please do something/anything else to resuscitate them! Nothing was done. When we got back from the hospital, one more pup was dead. He was perhaps already dead in the basket we had taken him to the hospital in. No one had noticed. Wednesday morning, two of the pups who had been quite OK so far started to cry non-stop. Subbu was the only one who was quiet and lay lifeless. We rushed them to another vet—a well-known vet nearby whom I had also been calling all through the night. This was the first time any treatment (antibiotics), etc. was recommended for the pups and was started too, and the Betnesol drops were increased to two drops twice a day. Had the vets advised us earlier, we could perhaps have saved the others too. Even this was too late. He immediately noticed that Subbu had an umbilical cord infection and asked us to isolate him. No one really expected him to live, but he did. By that evening all the pups quieted down and started to suckle. Things seemed OK. But by that night, two of the pups were again bloated and screaming. One was a beautiful caramel-gold female just like her mother, she’d been so healthy. She screamed all night in agony. The other pup, a glossy black male who screamed initially just lay on his side making soft intermittent yelps. He didn’t seem to have the strength to cry even though he was in so much pain. I made a couple of the vets available at night on the phone listen to the cries, and begged them to suggest something that might lessen their pain. I was advised gripe water. I rushed out at one a.m. to an all-night pharmacy for gripe water. The golden pup was dead by the morning. All of us were too numb to do anything, including Caramel, who seemed to have given up. 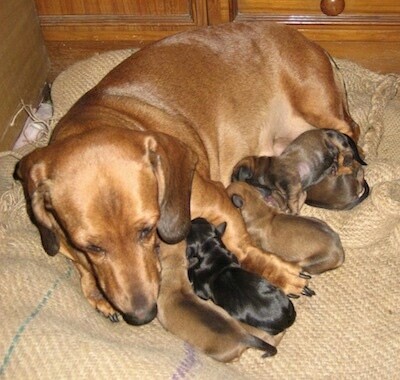 She just lay still and unmoving as her pups screamed and died. 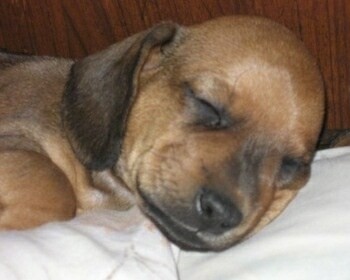 The worst sound in the world is that of an innocent, helpless little newborn pup screaming and writhing in pain. No, perhaps the worst sound in the world is that of a pup who is in so much pain and so weak that he can’t even scream. I’m not sure which is worse. I just feel that no animal should be allowed to suffer like that. I honestly do not mean to blame any vet or point any fingers. But if you’re in the business of saving lives, animal or human, I think it is important that you do so with passion and dedication and leave no stone unturned. Most articles on the net tell you to rush the pups to the vet if they scream incessantly for over half an hour. Most vets here told us to bring them in the morning, or dose them with gripe water, feed them, etc. Pups don’t wait till the morning. They die. Thursday morning we took the two remaining pups to CGS hospital. They agreed to help the remaining two pups despite not having a neonatal wing. But the black pup died on the examination table. He bled from the nose, ears and mouth. I had read on the net that one could give subcutaneous hydration. So we requested the doctors to do so for Subbu. His antibiotics were changed, and the Betnosol was stopped as we were told it could also cause an infection to flare up if too much were given. Subbu seemed to improve and started to perk up and suckle. Then Sunday night, he was bloated and started to scream and develop respiratory distress. We rushed him to the hospital and insisted they do something as we already had the director’s permission. They put him on the drip, his temperature was at 104 or something. He stopped screaming. We weren’t sure if he would live, but at least he wasn’t in pain. He spent ten days in the ICU. Veterinary services are not that good over here in India mostly due to a lack of infrastructure, training facilities and funds. Senior vets are usually available mostly during office hours and though some claim a 24/7 emergency service, only junior vets are available at night and didn’t seem to be able to do much. Again we do have some good vets, but they have long queues, a lot of patients and are difficult to get a hold of. Waiting for a long time in a room filled with sick animals with delicate three-day-old pups who should not be handled or exposed to infections creates a real problem. Another issue that we faced was that initially (the most important stage) no vet gave us any specific guidelines or tried to diagnose/treat the pups or rule out bacterial infections/septicemia as they all assumed that the pups were weak, were going to die or that it was herpes. We had to keep looking up information on the net/other sources, and check with the vets if this or that could be done. We had to insist that they give subcutaneous fluids to Subbu when he rushed him nearly a week later. The pups were severely dehydrated and if all of them had been given this hydration, they might perhaps have survived, but most vets would just look at them, pinch their necks (and we took them to two different hospitals initially) and tell us to keep them warm, give them an hourly feed and allow them to suckle honey, etc. In retrospect: A dog does try to communicate the best way that it can, and it’s important we try and understand. 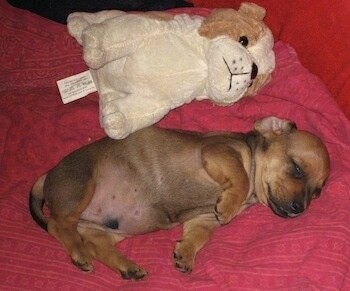 Very sick pups cannot be treated at home and it is important that as owners we be proactive. We need to insist on their being resuscitated and put out of their pain and misery immediately. No living creature should be allowed to undergo so much pain and suffering for so long. “In retrospect” are the saddest words there are in the English language, I think. Some great suggestions were offered by people whom I contacted over the net. On tube feeding, etc. : 1cc for each ounce of body weight every two hours. I would be getting puppy milk into him and not gripe water. Lactol is the puppy milk replacer. If he is 300 grams, 10 oz, he should get 10cc of Lactol every two hours. But if he is bloated he may need to be on a little less and on Clavamox (antibiotic). You need a VERY good scale. Weigh him and just make sure he goes up in weight 10+ grams per day. You need to get 1cc per 1oz of body weight into him. He should feed every 2 hours. A scale and heat are very important. We mark the tube with a felt marker to make sure we go 3/4 of the way down the body and not in the lungs. Tube every two hours. I like the Royal Canin milk. Rotate him every hour from one side to the other. 1cc of milk per 1oz of body weight. When he was admitted to the ICU he crawled around in an oxygen box: this is good. He is a singleton so tell them in the day to heat up a couple IV bags in the microwave and cover them and let him crawl around on the jiggly bags of water. It helps to stimulate him. Cover them with a light cloth first. Make sure they are not too hot. Many thanks all of you! Some things we learned along the way from various sources: The net, our vets at CSG, etc. If your dog is about to have pups, be proactive and prepared. Things usually go well; an article on the net said 98% of deliveries are normal, but.... As it did with us…it could just turn into a nightmare. If something seems wrong during the delivery or after—keep a watch on the pups and the mother and be ready. The underlying assumption amongst most vets, breeders and owners is that the pups are going to die anyway. I think that is a terrible assumption to start with when you’re in the business of saving lives or responsible for living creatures. It’s so much better to start with the assumption that the pups are going to live and try to save them, not suggest that they be put to sleep and most importantly help them avoid/reducing the pain and the torture, which we know today can be done quite easily. 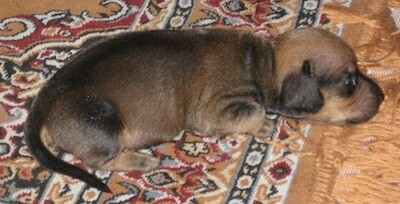 A lot of puppies with the fading pup syndrome are being saved globally by dog breeders and vets as well as owners. Three things are very important right from the beginning. Hydration. Temperature. Energy. Ensure that your pups feed every two hours, give them a suckle of honey/Karo to keep their energy going, keep them warm with a lamp, hot water bottle, whatever. They may just survive. If a puppy starts to scream for more than a half hour—don’t ask questions, don’t listen to anyone, and oh, please, please don’t wait till the morning or for a couple of hours. Puppies die immediately. Please, please rush them to any emergency for hydration, drips, and antibiotics. 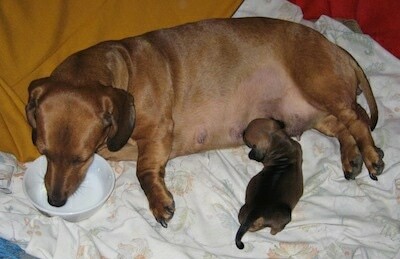 It’s impossible to feed a sick puppy at home for most breeders. Nothing works—not cotton wool, not lactose, not Royal Canin, not bottle, not dripper. As most articles/experts would tell you it’s an emergency that only a vet can deal with. Herpes (as I read on the net) IS NOT A DIAGNOSIS. It’s only when you rule out everything else including bacterial infections that you’re left with herpes. By then the pups are already dead, hence it’s best to take emergency measures and rush them to the vet for resuscitation. Please insist they deal with it. Most vets here don’t have neonatal facilities—this doesn’t mean the pups cannot be resuscitated by them. They can be given antibiotics if required and subcutaneous hydration with dextrose saline. Finally, pups can fade for several reasons, not just infection. They can fade if the mother doesn’t produce enough milk, has a distressed labour while delivery and is agitated, if they get cold—as a mother dog will not warm a pup that’s already cold. He will crawl away from the litter and lie on the periphery. You need to warm him before the mother takes him back. Usually, minimal steps are required to ensure most pups survive. Please also remember that most vets are not available at night, not even on the phone in New Delhi, India. There are very few emergency centres with 24/7 services. Please make sure you know who the good vets are. Bacterial infections and a number of other reasons have to be ruled out first before you conclude that it is herpes. My mother, a physician, discussed the matter with a number of vets and physicians, and was of the strong opinion all along that it was neonatal bacterial septicemia which is a life-threatening disease, and she also suggested that by vigorous management you can salvage the pups by maintaining hydration and preventing hypothermia, hypoglycemia and fever, as we do in human babies. If the mother has a distressed labour, or if the pups are listless and not able to suckle—it is best that they be put on antibiotics immediately after getting them to the vet. If the infection becomes fulminant, you cannot then save them. Pups can get a systemic (whole body, generalized i.e. septicaemia, which starts from the bloodstream) or localized (umbilical cord, etc.) bacterial infection which is usually caused by either gram negative or gram positive bacteria. Bev had initially suggested Clavamox, which is a good drug of choice, as it covers both types of bacteria. Other drugs that are good are Monocef/Septron as suggested by our vet’s. Its best to be aware of this and discuss this with your vet who is the ultimate expert. Pups can also get a viral infection (herpes virus, etc.) but this is difficult to diagnose and treat. The symptoms are similar (listlessness, bloated tummy, rashes) so it’s best to treat the symptoms. Pups with a bacterial infection stand good chances of being resuscitated. Antibiotics, and SubQ hydration can save them. You need to look after hypothermia (loss of heat), hypoglycemia (energy), and dehydration (fluid). When we cultured Caramel’s blood and milk, the milk was uninfected, but the blood grew sphingomonas paucimobilis—a very potent gram negative bacteria that is soil or water based, and is known to cause severe neonatal septicaemia. The black pup bled all over the table from his ear, nose and mouth, had a haemoglobin of 7g and platelet count of 50,000—another symptom of gram negative septicaemia. Hence, in addition to Monocef/Septran, Subbu was also given Amikacine, and is currently on Clavamox as he still has a gurgling sound in his chest. Any comments/prayers/suggestions from experts/vets globally on all of this would be welcome to ensure that this experience does have a happy ending, and that Subbu lives to be a strong old dog! 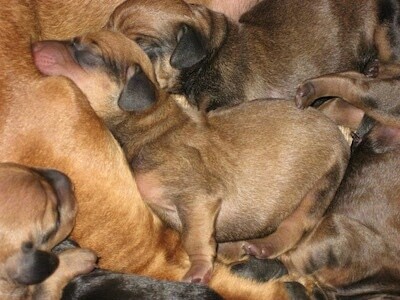 I hope that by sharing my experience, I can help other dog owners/breeders/vets save the lives of newborn pups. I would request all of you who read this to please share and pass on this or any other information you have. I really don’t understand what people mean when they say they’re not into dogs—you don’t have to be ‘into’ anything in order to treasure a life or do your bit to nurture it. So...if you’re not a dog person and you’re reading this, do share! Subbu never gave up and is still fighting it out. 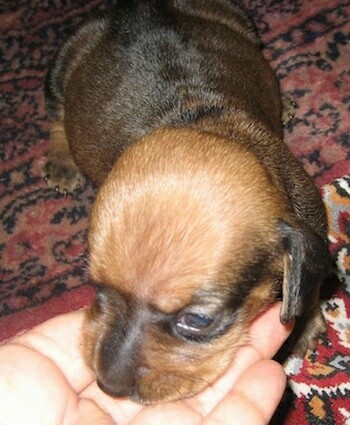 As the first born, he must have been a very strong little pup initially to have survived so far. What a fighter, and what an instinct for survival! I believe that all life is equally important and that all living creatures have an equal right to live. Most human beings however do consider themselves superior and most of problems with the world today are probably a result of our looking down upon nature and the web of life in which we are all interconnected. I laud activists, but I’m not one. One doesn’t have to be an activist to do one’s bit. It’s great to be passionate about something and work above and beyond the call of duty to make a contribution towards improving things or helping. So many people did in Subbu’s case—and I think that was truly amazing. Subbu pulled	through and is now a happy healthy little dog. He was adopted by our vet's brother. It was heartbreaking to see him go, but we were not in the position to keep him. Although he is a healthy pup, in case he gets sick ever, he's in good hands. All well so far except that we still miss him terribly. 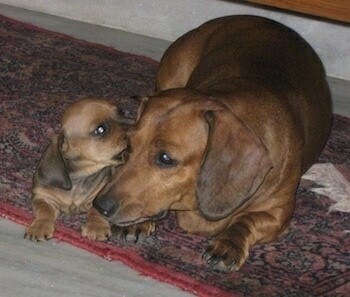 Subbu at about 8 weeks old with his mother.